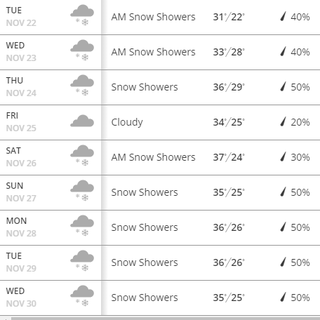 Finally some snow in the forecast! I have been watching the extended forecast with much attention over the last couple weeks. Opening day for my favorite ski mountain is coming up soon and finally some snow is in the forecast! I have a season pass so I will definitely be heading up there right after Thanksgiving. Who else is excited for ski/snowboard season to start in the Northeast? ?